“Designed and built to fall into line with the owner’s plans to sail round the world and compete in the superyacht regattas en route”. That in short is Sea Eagle, a gorgeous 43-metre sloop built by Royal Huisman that embarked upon her first sea trials in the North Sea in June of last year. She hasn’t stop sailing since. Having wintered in the Mediterranean, the Dutch-built beauty spent recent months in the Baltic making forays to the Norwegian fjords and the Swedish islands also. Her next port of call will be the Caribbean where this coming March, she’ll be champing at the bit on the start-line of the St. Barth’s Bucket Regatta 2017. 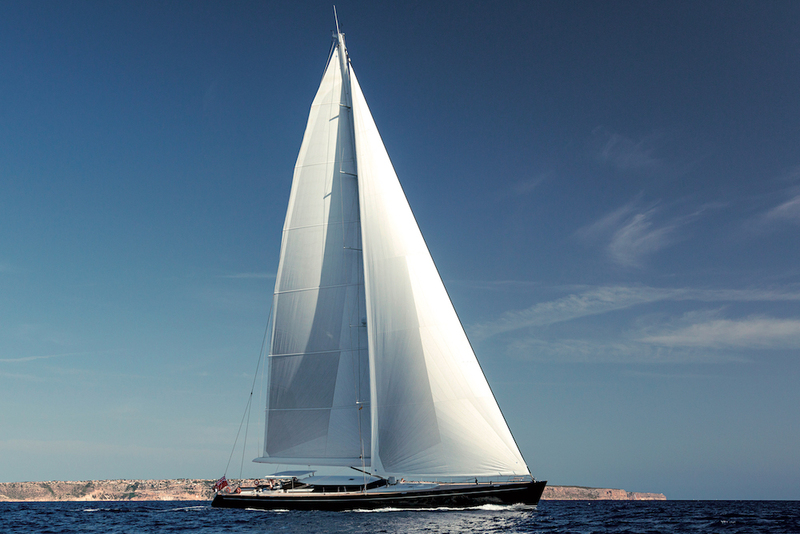 After Blue Papillon, splashed in 2013, Sea Eagle is the second example of the 43-metre series penned by Germán Frers for the Dutch yard. 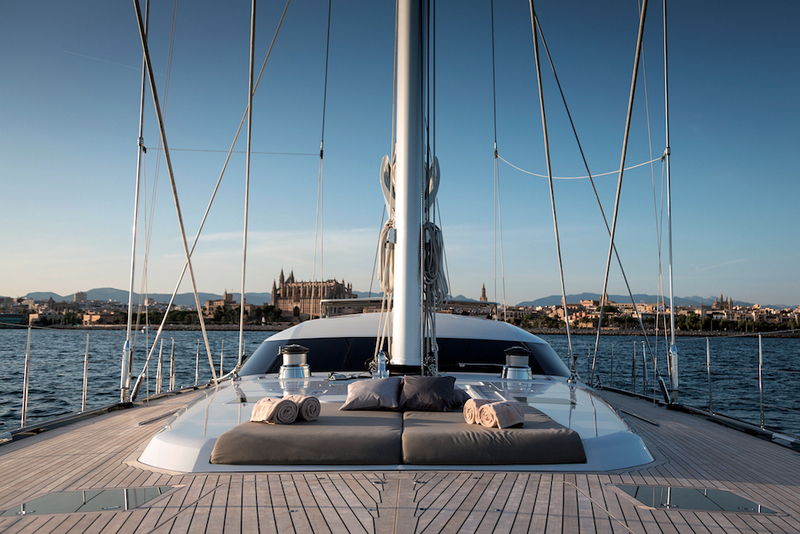 Her participation in the Caribbean event will boost Royal Huisman’s already-authoritative presence at the superyacht meet. At the last edition, two vessels from born in the sheds at Vollenhoven dominated much of the action with the 38-metre Unfurled and the 47-metre Hyperion taking victory in their respective classes. 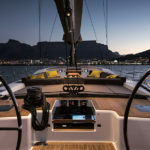 Built entirely from aluminium, their new sibling, Sea Eagle, displaces a mere 200 tonnes and sports a deep keel (with a 4.7-metre draught) and an impressive sail plan. All factors that conspire to deliver a sublime mix of comfort and performance. 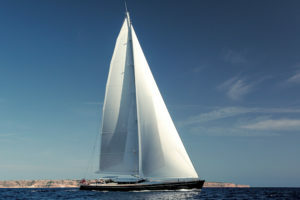 Her rig includes a sophisticated 57-metre carbon mast that spreads a good 1,000 square metres of sail, in fact. 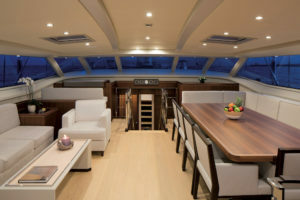 That said, twin wheels located neatly in the central cockpit mean the main deck is completely uncluttered with plenty of room for guests to relax. 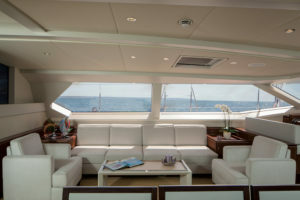 This includes a beach area aft of the second cockpit which connects with the master suite. 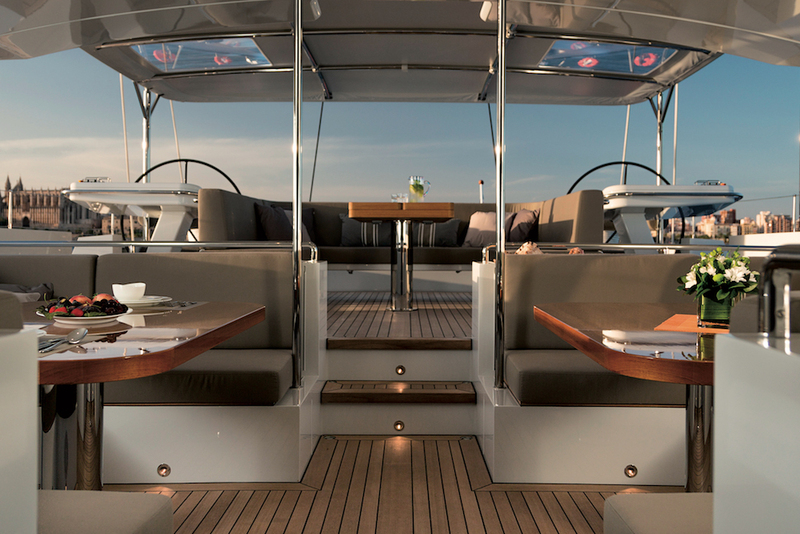 Two steps down from the rest of the sole, the beach area is a signature feature of Sea Eagle’s deck plan and it is also from here that guests move to the swim platform created by the open-down transom. 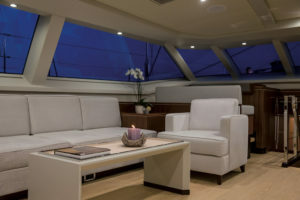 The large central cockpit, on the other hand, is the perfect spot for enjoying the pleasures of life under sail or at anchor. It is shaded too by the deckhouse overhang of which the bimini that protects the wheel area is an extension. 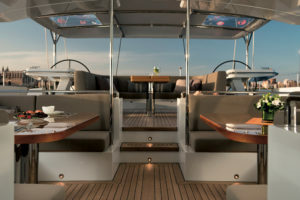 The central cockpit also opens into the Rhoades Young-designed interiors where pristine white sofas and arm chairs contrast delightfully with the darker walnut of the other furnishings, the paler birch of the panelling and, of course, the limed oak flooring. The overall impact is exceptionally sophisticated yet beautifully simple on a formal level. Featuring a dining area with the conversation zone and bridge to port, the open-plan saloon itself leads to a corridor forward off which three doors. 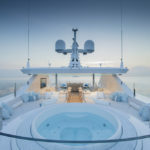 One belongs to a service bathroom, one to a cabin that can be used either as VIP accommodation or a gym, and the third to the galley and crew quarters. The latter’s cabins are forward with direct access to port to the engine room and stern garage where 5.7-metre Castoldi tender awaits deployment on a hydraulic slip. A short flight of stairs aft in the saloon leads to Sea Eagle’s lovely guest quarters. There two large two-berth staterooms precede the master suite aft. 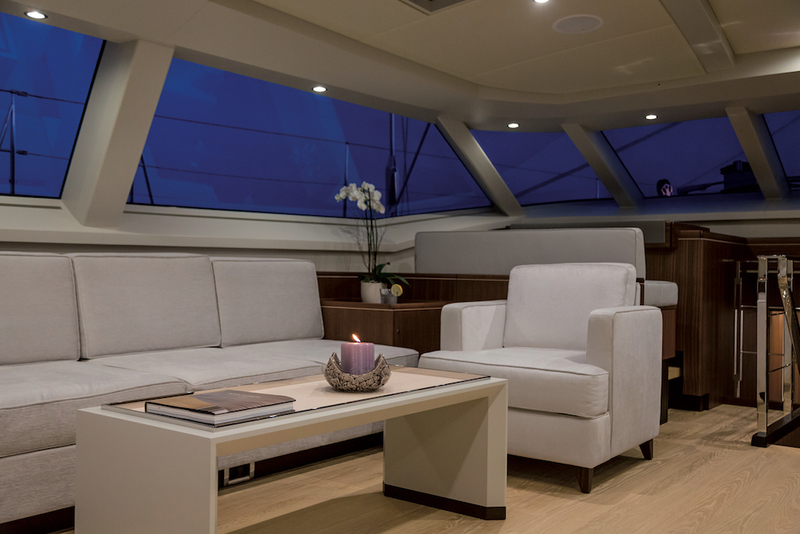 Located in an area just slightly narrower than the maximum beam of 9.89 metres, the aforementioned suite features two beds and a bathroom to starboard while sitting and office areas are to port. In the middle is a large open space with a stairs aft leading to the second cockpit. The charming contrasts and colour combinations seen in the saloon continue in the master suite with the beds and seating in white juxtaposed with richer walnut, birch and oak grains. 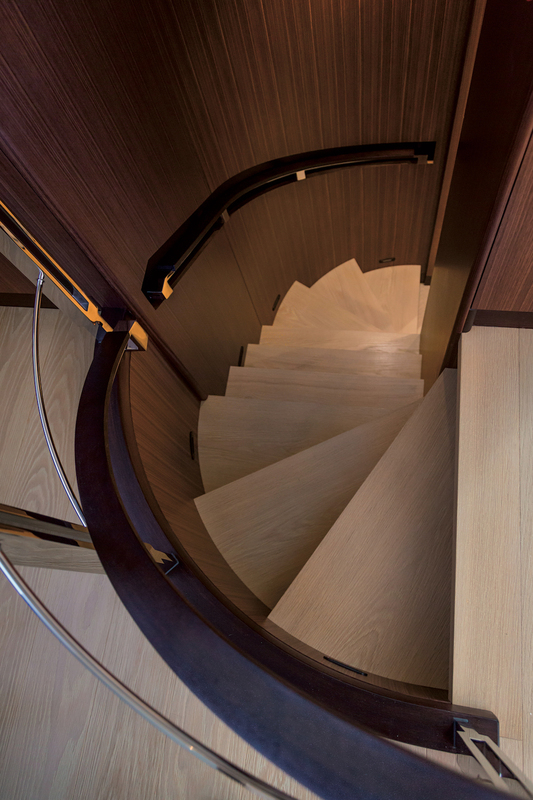 Of course, the spectacular craftsmanship and finish for which Royal Huisman yachts are renowned worldwide feature also aboard Sea Eagle. 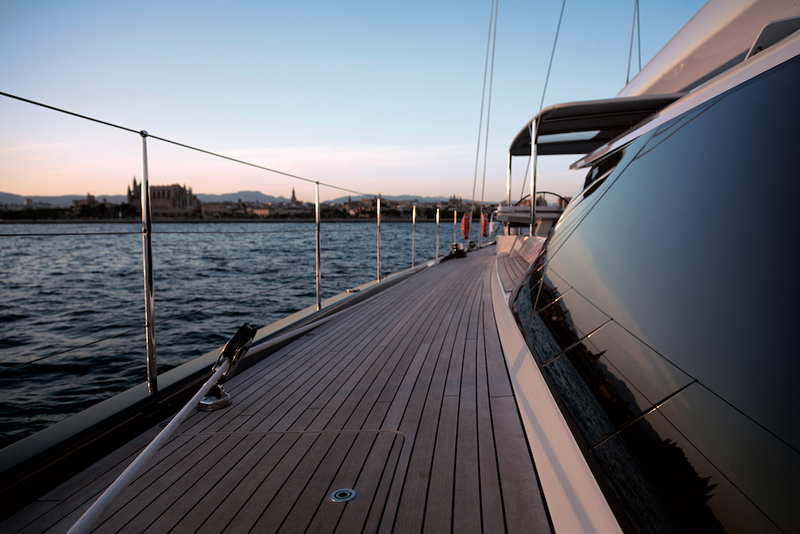 Her owner, Taiwanese businessman, Mr Samuel Yin, has declared himself absolutely delighted with his new yacht. 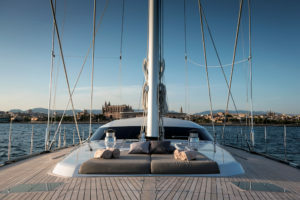 He is so pleased with the yard’s achievements, in fact, that he has made her available to it for presentations around the world in a nod to the talents of three yachting greats: Royal Huisman, Germán Frers and Rhoades Young.